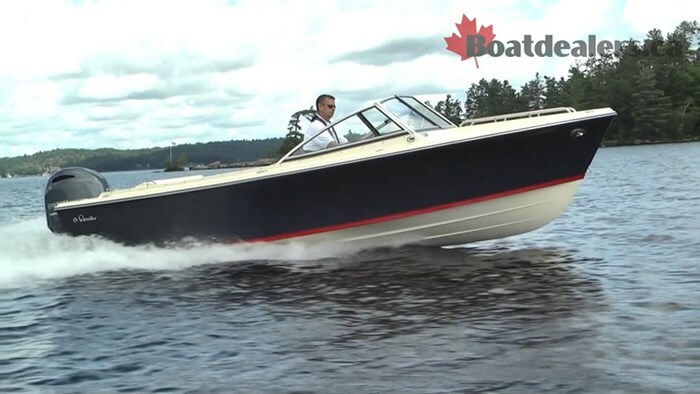 Rossiter owners throughout North America have been asking for a 20’ option and the new R 20 will not disappoint. The attention to detail, the painstaking fine tuning and craftsmanship is evident in every single aspect of this beautiful boat. 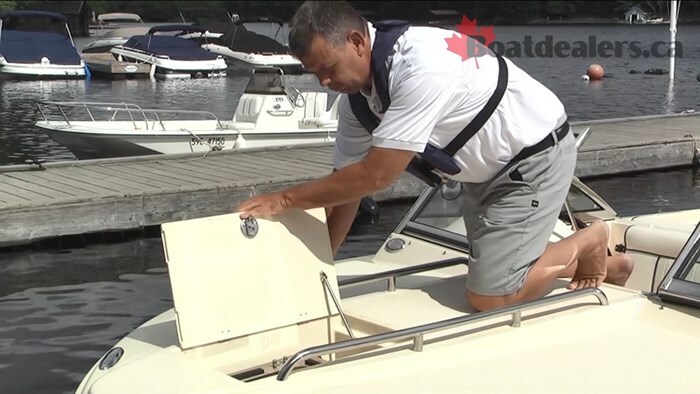 As I boarded at the swim platform I was greeted by an anchor locker on the starboard side with an access hatch to the main battery, a nicely engineered 4 step re-boarding ladder molded into the platform and a well hinged gate for easy access entry into the boat. Standing on the platform and looking into the cockpit it’s impossible not to notice the amount of space this 20 footer has. The R 20 is rated for up to 9 people – what I especially loved about this design was knowing that with 9 on board you would never be crammed – there’s just a ton of space in here. 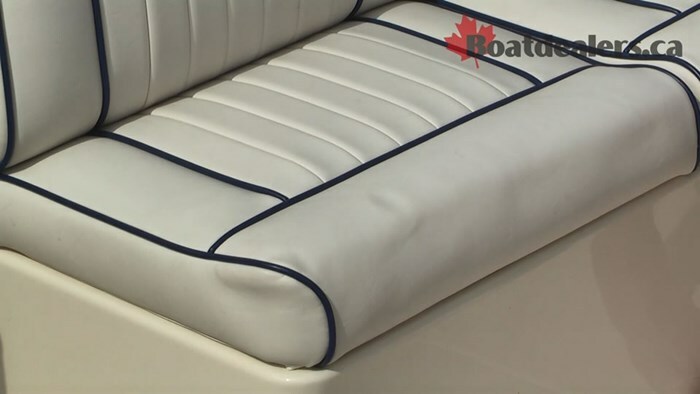 The seat backs and seat bases are very nicely done using quality materials and under 5 seats there are secure dry storage areas. 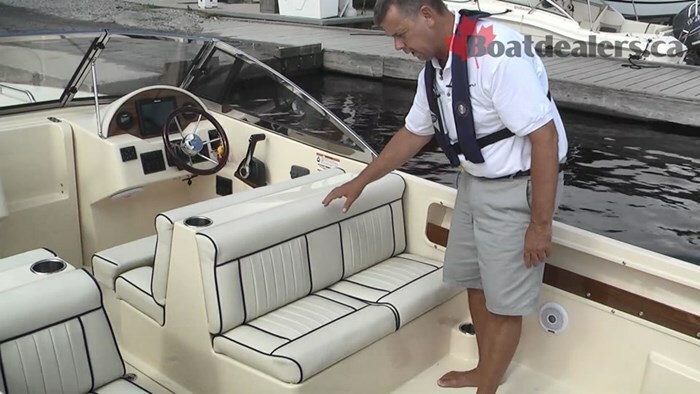 After listening to customer feedback, Rossiter took the time to design a block under the seat base the marries to the latches on the storage compartments when they are in the locked position. This is a brilliant way of ensuring the items we want kept dry are indeed kept dry. 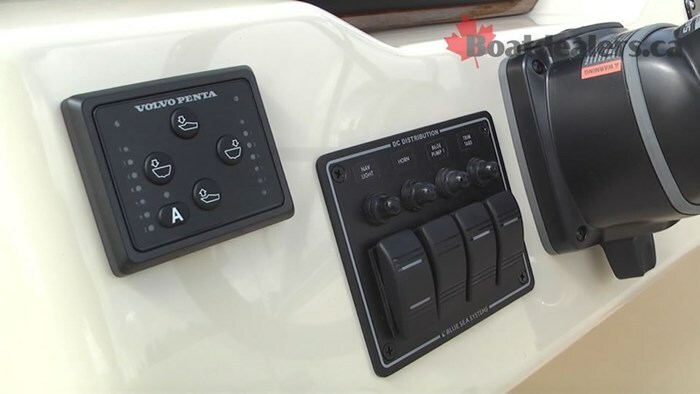 There’s a full sized ski locker in the floor, of course neatly trimmed and finished, a monster of a glove box on the passenger dash and huge forward ‘trunk’ for covers, PFD’s and an optional porta-potti. Up on the easily accessed bow, Rossiter designed a hatch that houses an additional re-boarding ladder and a bow anchor. There’s a couple of stainless rails running from just forward of the windshield to the hatch and I could see consumer demand for a sun pad up here. 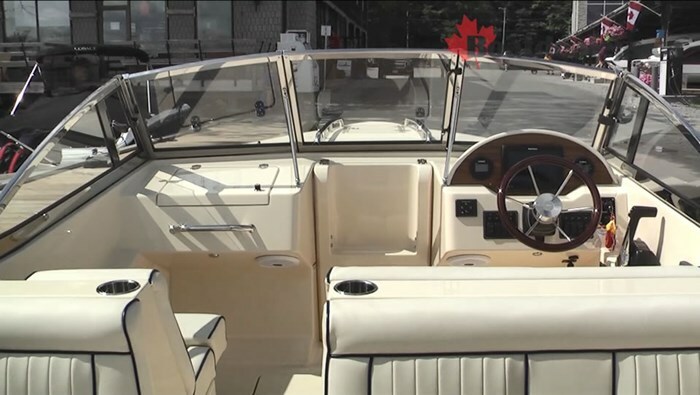 The helm on the R 20 is very well thought out with a flip up bolster for the passenger seat and another flip up bolster for the double wide helm. Certainly not hard to envision an evening cruise with someone special beside you at the helm enjoying the moment. 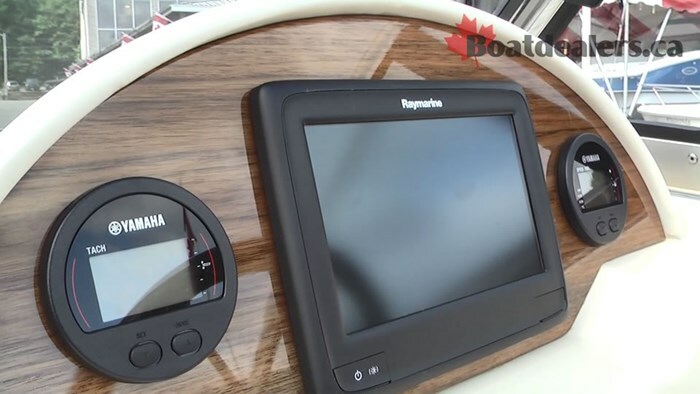 Rossiter owners have the ability to choose from a variety of gauge packages and there’s room here for an 11” screen of your choice as well. 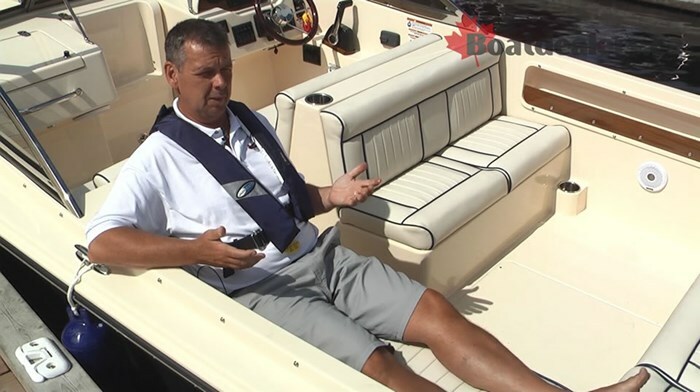 I was pleasantly surprised to see a set of Volvo trim tabs included as standard on the boat. As we headed out to the lake for some testing I was excited to see just how well this big boat would run with the 150 HP Yamaha on the back. 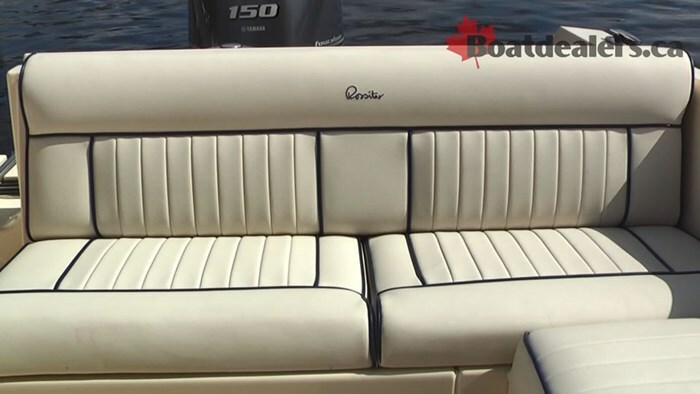 She’s rated for up to 200 HP but the folks at Rossiter recommend the 150 HP pairing and offer either Yamaha or Mercury packaging. She certainly didn’t disappoint. With two of us on board and a full 246L fuel tank we were up and on plane in under 4 seconds. Rossiter promised us a top speed of 42 MPH with the right prop (we could only get 5300 RPM and the 150 will run up to 6000 RPM). On the boat speedo and my GPS we topped out at 40.5 MPH. I’m confident that with the right prop the R 20 will easily see 42 + MPH. More importantly was the cruising speed and the results were excellent. At 20 MPH we were averaging 4.3 miles per gallon at 3200 RPM and at 26 MPH we dropped to 4.1 miles per gallon and 3700 RPM. 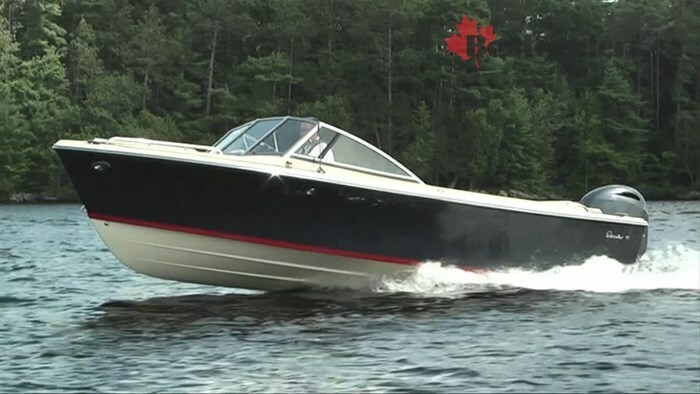 The hull rides beautifully at any cruise speed in this range. All in all this is an awesome boat. The fit and finish, the attention to detail and the absolute quality and craftsmanship is everywhere in this design. My Dad said you get what you pay for and Rossiter has assured that for every dime you spend there’s a 25 cents worth of value.